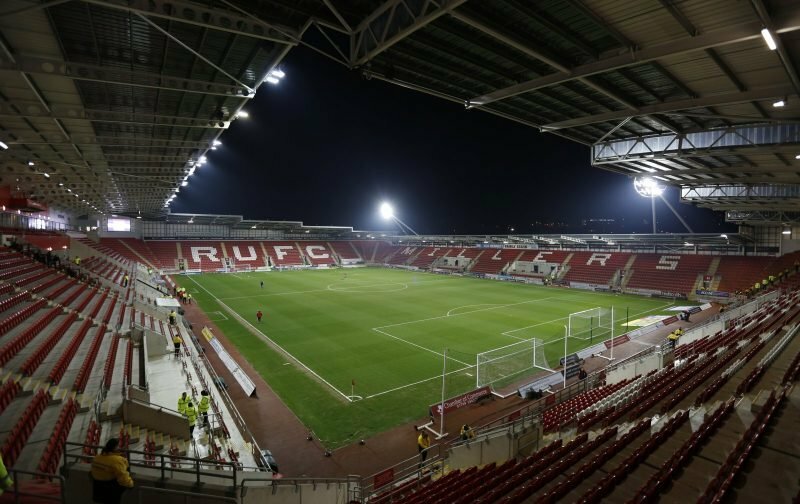 Another exciting game at the New York Stadium saw Rotherham United get a second home draw of the week this evening though they will probably be left wondering how it wasn’t all three. A late change saw Richard Wood break down in the warm-up with Jon Taylor starting in his place plus a warm-up accident saw Will Vaulks, who took over the skippers role, sporting a black headband on a bad cut. A good start from the Millers saw City ‘keeper Niki Maenpaa get down well to a shot from Michael Smith before he did well a minute later to save from Ryan Williams. Ryan Manning let fly from the edge of the box only to see his shot blocked and although it fell to Joe Newell his cross towards Smith was cleared. At the other end Will Vaulks did well to get a foot in to stop Famara Diedhiou getting to a free ball. The hosts came close on the quarter of an hour mark after a good cross from Matty Palmer found Billy Jones he flew forward to send a great ball in towards Williams who out-jumped his man only to see the ball go just wide of the post. After some good build up from the visitors Diedhiou did get the ball into the back of the net only to turn and see the linesman’s flag up for offside. Minutes later after putting the ball over his marker Newell turned and shot only to see a defender put the ball wide when it looked like it could be the opening goal. The Millers upped their game and Smith and Williams both had chances before some good work between Taylor and Williams saw the ball fall to Smith who was about to shoot but a Robins’ defender put the ball behind and from the resulting corner a Vaulks header brought off another good save from Maenpaa. A couple of minutes later more good work from Taylor saw him put the ball into the box for Smith but it was cleared before it reached him. In the last minute of the half Marek Rodak had to be alert when Callum O’Dowda raced onto a ball with the Millers’ ‘keeper getting there before him. It became clear which team had received the sterner team talk at half-time with City winning a free-kick in the opening minutes and Niclas Eliasson floating the ball in towards Farara Diedhiou at the far post but Joe Newell was there to put the ball behind with the resulting corner coming to nothing. Straight down the other end a superb cross in from Newell found the head of Michael Smith and with the goal at his mercy the Millers’ striker put the ball over into the Millers fans behind the net. More good work from Newell saw him send the ball to Smith who in turn knocked it down for Matty Palmer and with the midfielder about to shoot at goal the whistle blew and he had handball given against him. City’s first substitutions of the night came on the hour mark Callum O’Dowda making way for Matty Taylor and Marley Watkins coming on for Niclas Eliasson. A long kick from Niki Maenpaa fell to Diedhiou just outside the box whose shot was well saved by Rodak before the Millers’ ‘keeper also saved a shot from Watkins. Jack Hunt saw a shot blocked before a Matty Taylor corner found Nathan Baker who shot high and wide from near the penalty spot. Joe Newell was replaced by Anthony Forde for the Millers. Everything for the visitors seemed to be falling to Watkins and within a couple of minutes he had a shot saved and then Palmer blocked another shot on the line before a shot from the left of the box hit the post and went to safety. At the other end the lively Ryan Williams sent Smith on his way but with his back to goal the move came to nothing. Matty Palmer was replaced by Ben Wiles for the last fifteen minutes and after two corners the ball fell to the young substitute who tried his luck from just outside the box only to see Maenpaa get down to save. The first yellows of the game saw Ryan Manning of the Millers and the Robins’ Lloyd Kelly booked which was followed by some nice work from the hosts inviting Williams to shoot from some thirty yards out but his effort went over the crossbar. With ten minutes to go City’s last substitution saw Jamie Paterson replace Andreas Weimann. A lovely ball into Williams from Vaulks saw Maenpaa save before a header from Adam Webster at the other end went over the bar. Former Millers loanee Jack Hunt was the next player to see yellow for a poor challenge on Forde with Manning’s curling free-kick going just wide. City raced down the other end and a good shot from Paterson hit the crossbar with the Millers getting the ball back with the lively Williams whose shot was deflected towards Smith who saw his shot blocked by Maenpaa and go to safety. Smith was booked after he fell over Nathan Baker whose arms were all over the Millers striker followed by some great work from Manning who weaved in and out only to see his shot saved by the goalkeepers foot. In time added on Semi Ajayi had to be on his toes to stop a shot from Matty Taylor before a late corner for the Millers was well claimed by Maenpaa. As the game was coming to an end Bristol City’s Josh Brownhill was booked followed by their Manager Lee Johnson enraged referee Gavin Ward enough to show him a yellow card too. As I said another good game at the New York Stadium, just a pity that there were less than eight thousand two hundred fans there to watch it.